Bathroom maintenance isn’t the most glamorous of household chores, but it’s still an essential part of keeping your home clean and secure. Aside from the obvious chores that keep a bathroom in good shape – sweep and mop regularly, clean the toilet weekly, etc. – there are other steps that empowered homeowners can take to help keep their bathrooms operating at peak efficiency. After it’s been used for a while, your showerhead is likely to develop an uneven spray. This is caused by a buildup of minerals from the water, and this can be fixed fairly easily as long as you have an adjustable wrench or channel-type pliers. First, use the wrench/pliers to unscrew the swivel ball nut from your showerhead (that’s the one that attaches directly to the head piece). To keep the wrench from damaging the finish, you can cover the jaws in masking tape. Next, unscrew the collar nut (which connects the showerhead to the pipe that comes out of the wall). Once you’ve removed the showerhead, use a thin piece of wire to (gently) clean the inlet and outlet holes, and scrape away any deposits that have built up. Next, flush it out with clean water. If there’s a lot of buildup that can’t be flushed clean with water, soak the showerhead in vinegar overnight. After that, simply reassemble the showerhead the same way you took it apart. One of the easiest ways to prevent the bathroom sink or shower drain from clogging is to use drain covers, which collect the hair, soap residue, and other materials that build up on the inside of pipes and (eventually) stop them from emptying. Another simple preventative measure you can take to prevent drain clogs is to use a homemade drain cleaner. It’s easy to make, and it’s cheaper than buying drain cleaning products from the store. In an airtight container, mix 1 cup baking soda, 1 cup salt, and ¼ cup cream of tartar. Pour approximately ½ cup of this mixture into the drain, followed immediately by one quart of boiling water. The combination of ingredients in this mixture makes a very powerful cleaner, and is one that should keep your drains clog free when applied on a monthly basis. r time, and use a flashlight to make sure you have a good view that’s not obstructed by darkness or shadows. 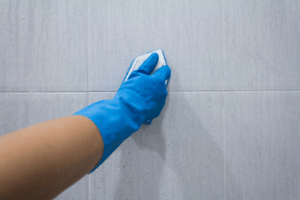 Thanks to the moisture that tends to build up in bathrooms, eventually the caulk and grout that is used to keep fixtures in place will start to wear. This can lead to loose tiles on the floor and walls, which can then lead to water getting under the fixtures and causing damage. To keep this from happening, apply sealant to grout and tile at least twice a year. 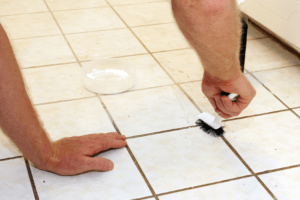 If you find a loose tile, repair it as quickly as possible. American Bath Enterprises is a premier supplier of shower stalls, bath kits, and other bathroom fixtures and accessories. Learn more by speaking to one of our sales representatives today at 888-228-4925.